Tetraodon fluvialatilis is found in Sri Lanka , Bangladesh, Myanmar and Borneo. There is no sexual dimorphism. Seems happy in pairs and with other fish of similar size. Will eat invertebrates. Snails. This fish is a carnivore and needs to eat snails (ramshorn, apple, pond snails, etc.) and will eat blood worm. MTS snails are not generally touched. Often bought to clear an aquarium of snails. But will require additional snails after a few months in order to keep their beaks in trim and well fed. Bloodworm can be fed weekly as a treat. But they need hard foods. Heavily planted, well oxygenated aquarium with medium to little water current and non-too bright lighting. Active predator of snails and other small fish and invertebrates. Generally less aggressive than Figure 8 (Tetraodon biocellatus) puffers. These are carnivorous and therefore very active hunters of all surfaces of an aquarium. They therefore like to explore continuously. When stressed (usually at feeding) these fish turn their belly dark and also do the characteristic caudal fin bend with its tail common to most puffers. Looks very similar to the Figure 8 Puffer (Tetraodon biocellatus) except that the white underbelly has dark circular markings throughout it. When young these markings are very light so can be hard to spot, care is required in inspection. 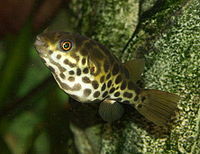 Their belly shape also has a more pronounced bump in it than the Figure 8 Puffer. This page was last edited on 16 December 2017, at 19:03.